Wondering what the differences are between termites and carpenter ants? Perfect, you're in the right place! Quick question: do you lug a microscope with you everywhere you go? Luckily, though, we'll give you a quick run-down of how to tell whether those bugs infesting that wooden plank are actually ants, or the dreaded termite colony you hoped you'd never have to deal with. Make sure you get to the section about prevention as we have a nice couple of videos to show you where they like to hide and how to spot each pest. Are Termites Worse Carpenter Ants? What Do Flying Termites Look Like? What Do Flying Ants Look Like? Where Does Each Species Live? What do termites look like to the human eye? When it comes to identifying bugs that look like termites, it helps to know what a termite actually is. Let's take a moment for a crash course in all things termites--from termites signs to termite damage. There are thousands of different species of termites across the globe, but the three most common types of termites in the United States are as follows: drywood, dampwood, and subterranean. Drywood Termites: Drywood termites live mostly in sturdy wooden poles or wooden structures which are sealed from moisture. It's not uncommon for these termites to live within wooden furniture, which makes them easy to transport across state lines--often unbeknownst to the owners of the furniture and the movers. Dampwood Termites: Dampwood termites, as the name suggests, live in rotting and moist wood. Old trees and logs floating in water are the perfect home for dampwood termites, as they require access to free water to survive. Subterranean Termites: Subterranean termites bury themselves in the soil and make contact with wood through the ground, or via tubes of mud built by worker termites in the colony over long periods of time. If you see one of these sand-colored tubes stretching from the dirt into a crack in your home, this is a giant red flag that your house may be infested. Termites feast primarily on wood because their digestive systems break down the cellulose that naturally occurs there, making trees, lumber, houses their ideal dietary staples. While termites will certainly chew right through your wallet (a stabbing pain we know all too well), they're not going to bite humans or pets. Living beings offer nothing to termites, nutritionally speaking, so they're going to stick to what they know: the cellulose in wood. Because of their below-ground lifestyle, subterranean termites are widely regarded as the most destructive type of termite out there. The colonies can fester below the surface for years before a homeowner has any inclination whatsoever that an infestation is there, waiting to crop up. 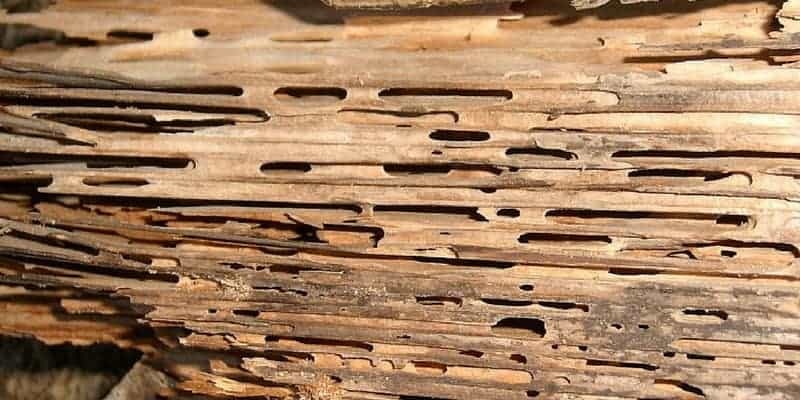 Often, destruction occurs to a home for months or years without a homeowner's knowledge--only to come to light once significant damage has been done by a termite colony. It's estimated that across the United States, over $2 billion are spent each year to correct the damages caused by termite colonies as well as prevent further infestations! Want to skip all this research and just hire a decent exterminator for your termite problem? We've all seen ant hills as kids, and we've probably all had the misfortune of being stung by a fire ant once or twice. But did you know that there was a such thing as a gigantic flying ant? Keep reading for answers to all the questions you never knew you had about ants. There are several different types of household ants in the United States, but the main way to distinguish between ants is to examine a few key features on their bodies. An ant's body is separated into four main parts: the head, thorax (a back-like portion), node (a waist), and gaster (the abdomen). Ants are commonly split between one-node and two-node classifications, meaning that either one node or two nodes can connect the gaster to the thorax. Thankfully ants are mostly harmless. They mainly feed on food sources like sweets and starches, commonly crawling into unsealed bags of refined sugars and candies to feed. Pharaoh ants have the ability to transmit disease bacteria, but this is not very common. Household ants themselves don't cause much damage (if any at all) to a home. They can weaken wooden structures in large numbers over a significant amount of time, but more often than not, they're not ants at all--just misidentified termites. Ants can loosen the soil around a home, which in turn can weaken its structural integrity, but not by much. If anything, ants can actually be considered beneficial: their nature as scavengers get rid of other insects you don't want hanging around. The carpenter ants is the ant you want to watch out for when it comes to property damage and home destruction. Here's where everything gets tricky: there's a type of insect out there that looks like a termite, acts like a termite...but isn't a termite. When you're trying to determine whether you're dealing with carpenter ants vs termites, you've come to the right section. As we mentioned above, termites only eat wood and grass. Their stomachs can only digest the cellulose as a fuel source, and that cellulose comes straight from timber (click here to see what else termites eat). Despite living in decaying lumber sources, the carpenter ants do not subsist on the wood whatsoever. Instead, they eat sugar and protein like fruit and dead bugs. In fact, honeydew secreted from aphids are a carpenter ant's favorite food sources! When tying to prevent carpenter ants, exterminators will often target these pests as they are the source of the problem. Worker termites create messy, uneven tunnel systems with no rhyme or reason when they crunch through the wood. Carpenter ants, however, make smooth tunnels known as galleries in the wood. Let's be honest--no one wants a pest in the house. 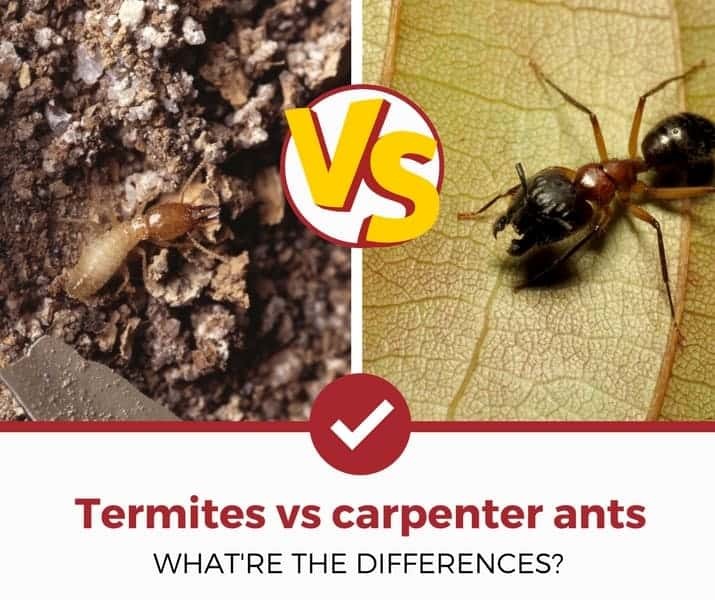 We just went over the difference between termites and carpenter ants, but here's the similarity: they're both nuisances that need to be dealt with by a trained professional sooner rather than later. Both types of insect will destroy the wooden structure of your home. Termites do so for food, while carpenter ants do so for shelter. Without a doubt, termites (specifically subterranean termites) cause more damage racking up an estimated $5 billion in property damage to homes across the United States each year. Most of the time, homeowner's insurance won't cover the damages caused by these sneaky little guys, which makes regular inspections in high-risk areas an absolute must! If you've got carpenter ants, though, you're not totally home free--they're not that far behind termites in terms of potential damage. They can bore their way inside your home, weakening its structure, then turn right around and feed on the sugars in your kitchen! Regardless of which you have, you should prepare a plan of action to remove them! Termites can be found all over the continental US, and each type of termite takes residence in different areas depending on the surroundings it needs. Dampwood termites, for example, are usually found only in wetlands, due to their swampy, high-moisture environment. The below video is perfect, as it shows a pest control professional reviewing a house and inspecting it for termite or carpenter ant damage. 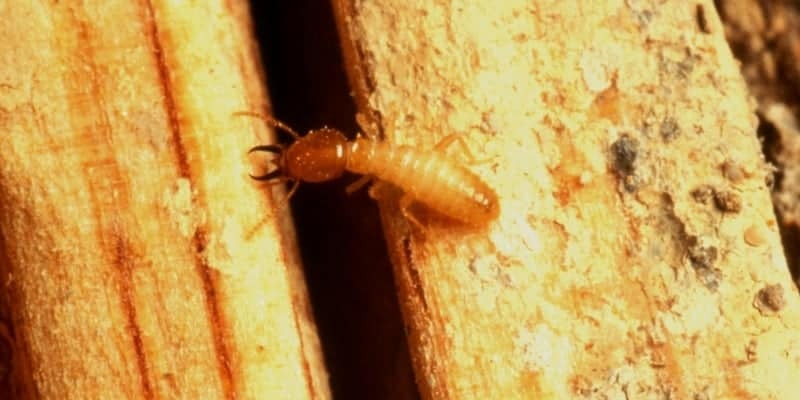 Drywood termites, in contrast, are usually found in humid places like the southeastern states, where they can draw moisture from the air around them rather than the wood where they live. Subterranean termites are the wildcards--anywhere with soil and wood is prime real estate for these guys. As their name suggests, these termites burrow within soil rather than primarily within the wood itself, meaning that they're mostly found in forests and underground...or under your property. Carpenter ants are found all over the US, and even though they make cozy little homes out of wood, they don't feed on it. This is the main reason they're mistaken for termites so frequently--that, and the fact that their bodies are so small that it can be hard to identify the differences without a magnifying glass. In addition to wood, carpenter ants can nest in small, man-made pockets of homes like doors, underneath bathtubs, floor joists, attic eaves, and even in asbestos. Here's part 2 of the video from above, a must watch. Just when you thought these bugs couldn't get any more terrifying...guess what? Some can fly right at your face. These are easily identifiable on their own without any special equipment by three key features: wing symmetry, body shape, and antennae. The wings of a termite are long and equal to one another in length, spanning the size of the termite's body a few times over. The termite's body shape, in addition, is boxy and almost rectangular--very slender with little variation or contour. The antennae of a termite look more like the rabbit-ears from television sets of the past, sticking straight out from the head. Winged carpenter ants, however, have asymmetrical wings which layer and flutter. Their bodies, as mentioned earlier, have the pinched-waist appearance due to the node between the thorax and the gaster, which differs substantially from the appearance of the winged termite. The most commonly-noted difference, though, are the elbowed antennae: an ant's antennae bend like a human's elbows, feeling around in front of them. You're probably asking yourself something like this: How do I get winged termites in my house to begin with? A flying termites swarm or a flurry of winged carpenter ants are actually pretty comparable because their missions are the same: to reproduce. Both winged termites and winged carpenter ants take flight in order to find a mate and lay eggs, ultimately beginning a new colony which will last for years to come. In the case of winged termites vs flying ants, the termites still take the cake. ...and the table the cake is sitting on, and the floorboards underneath, and everything else in the house. 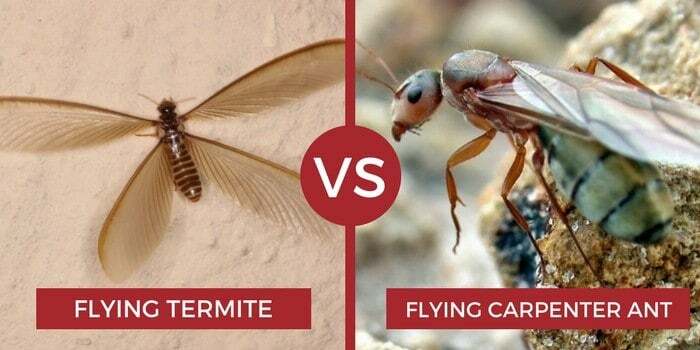 Flying termites and flying carpenter ants are the same species of normal termites and normal carpenter ants--the reason they have their wings is because they are the reproductive part of the colony. When you see a termite or a carpenter ant with wings, you're seeing the king or the queen of the colony take its flight to find a mate before settling down to populate a colony--the colony which could eventually burrow away at your home. Before the inaugural flight, the flying termite or carpenter ant lives in its home colony, maturing into adulthood. Depending on the species (as mentioned above), this could be in a swampy lagoon or the dry insides of a sofa in a moving van. After reaching adulthood, the insects make a leap out into the world--the only ones of their species to do so. Winged termites and winged carpenter ants are the singular members of their kind who see the outside world, and only for mating purposes. Once a mate is located, the pair retires to build a chamber below ground and create a new colony. Though flying termites and flying ants may look similar to the untrained eye, they're actually quite different. It's important to understand why witnessing a flying termite or ant is a sign of a new colony brewing, whereas seeing a normal termite or ant might invoke a different response. If you notice these pests in or around your home, though, the key is not to panic. There are steps that can be taken to give these guys the boot without packing too much of a punch on your wallet. When you're educated on how to spot the differences between termites and ants, you're much more likely to avoid the costly mistake of misidentifying these sneaky insects. Curious about other termite related articles? Check out our other detailed guides to help you deal with your pest problems.